Will Darlene ever get to smile? That's what I really wanted to know when I spoke to actress Carly Chaikin who plays Darlene in the hit TV series, Mr. Robot. Now into it's third season Mr Robot follows anti-social computer programmer Elliot (Rami Malek) who works as a cyber security engineer during the day, but at night he is a vigilante hacker. He is recruited by the mysterious leader of an underground group of hackers to join their organization. Elliot's task? Help bring down corporate America, including the company he is paid to protect, which presents him with a moral dilemma. Although he works for a corporation, his personal beliefs make it hard to resist the urge to take down the heads of multinational companies that he believes are running -- and ruining -- the world. The show has definitely struck a chord with viewers. It won Best Dramatic Television series last year at the Golden Globes and best performance by an Actor in a Supporting Role in a Series, Limited Series or Motion Picture Made for Television for star Christian Slater. Also last year the brilliant Rami Malek won an Emmy for Outstanding Lead Actor in a Drama Series. ( there have also been many more nominations for the show). There's no question that 27- year old Carly Chaikin is the reigning tough girl of television. As Darlene, Elliot's troubled hacker sister she is constantly in a dark place and has plenty of issues to deal with, not to mention her troubled relationship with her brother! While grounded in some reality, the show can spark a certain type of paranoia. Mr. Robot has made viewers so much more aware of everything going on around and that includes Chaikin. She is constantly thinking about who might be watching her or trying to hack into her personal emails and information. It's pretty frightening out there folks! 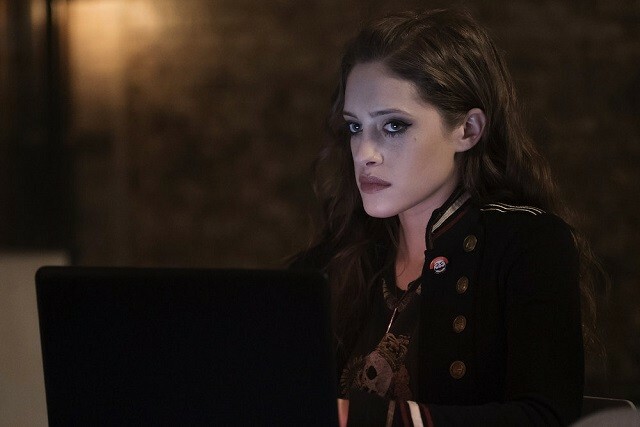 I had the opportunity to chat with Carly Chaikin via satellite from Los Angeles about how working on the show has changed her, working with Rami Malek and Christian Slater, the complexity of the scripts and whether or not we will ever get to see poor Darlene in a happy place.